This article discusses the reasons why you may need to change or upgrade a Consumer Unit (CU) aka "Fuse Box", and covers the procedures to follow. Note that this represent major electrical work, and should not be attempted unless you are confident that you understand the technicalities involved, and can produce an adequate standard of workmanship. You will also need access to specialist test equipment such as an earth loop impedance tester, and insulation resistance tester, a low ohms meter, and a RCD tester (or equivalent multifunction tester). You should have access to a copy of the IEE on-site guide and a copy of the IEE Wiring regulations. Note that most of the work described here would be classed as a "notifiable work" under Part P of the building regulations. When carrying out earth fault loop tests, and insulation resistance tests on virgin installations, one should take great care to ensure that no other occupants of the house are put at risk of exposure to high touch voltages should it turn out there is a failure in some part of the protective infrastructure, and that adequate warnings are given before testing. There is often an implicit assumption that a modern CU with resettable Miniature CIrcuit Breakers (MCBs) will be "better" than an existing one that has cartridge or re-wireable fuses. It is important to understand that both types of fused circuit protection are still permissible in the current wiring regulations, and can offer the required levels of protection. There are also disadvantages to changing from fuses to MCBs in some cases. You need to better integrate (or provide for the first time) RCD protection for circuits. You have a rewireable fuse CU and there is a risk that uninformed people may attempt to re-wire a fuse with the incorrect rating wire. You have older PVC T&E power cabling with undersized earth wires and re-wireable fuses. You need to separate out circuits to allow independent control - say for time switched electric heating, or for a power feed to an outbuilding. To rationalize or simplify an existing system which is complex (either just to reclaim space, or to make use of the system less prone to errors). Nuisance trips. Compared to fuses, modern MCBs react more quickly to very short term overloads, and may result in loss of power to a whole lighting circuit when a bulb blows. Expense: Changing a CU can be expensive, and may not bring significant benefits in overall safety. There may be other more serious problems with an electrical installation that are better addressed first. Extra work: Fitting a CU with RCD can often result in the installation not working initially due to hitherto unnoticed faults in circuits such as a borrowed neutral or higher than expected earth leakage. While discovering these faults is not a bad thing, it can force the investigation and repair of a number of other issues not directly related to the original task planned, causing unexpected cost and delay. Note that steps can be taken to minimise these potential problems, such as using HRC fuses where more appropriate (e.g. feeding submains to outbuilding CUs), or using type C MCBs on lighting circuits etc. Consumer units typically need to be within 2m of the electricity meter unless an additional switch fuse is fitted to protect the tails. They should not be mounted on the electricity suppliers meter board (although this is quite often seen). An ideal location should also make access to the CU easy without need to resort to ladders or climbing past obstructions - since you may be doing it in the dark. The spaces into which circuit breakers and other devices may be fitted are called "ways". Generally each device (and hence often each circuit) will take at least one way. When selecting a new CU, it is wise to choose one with enough ways to accommodate all of the proposed circuits, and to leave a few spare ones for future applications. Note also that some devices that can be mounted in a CU such as contactors, time clocks, bell transformers etc, may be wider than a standard single module and hence take more than one "way", and some of these more exotic devices may also require a space to be left beside them to facilitate cooling. Any modern CU will typically feature at least one RCD, and quite probably more in new designs. When selecting a CU, one option that is often overlooked is to use more than one CU rather than one big split load one. For example, it may be simpler to position a pair of smaller CUs in a confined space giving adequate free ways. In the case of houses with TT Earthing, the normal 16th edition style single CU solution involves a 100mA time delayed RCD in the position of the main switch, with the 30mA RCD in the split load position (the time delay resolving the problem of discrimination between the RCDs under fault conditions). Using two CUs will allow a normal 100mA RCD to be used on one CU dedicated to circuits that do not require direct contact protection, and the other for socket circuits etc. This will save the cost of a time delayed RCD since there is no need to cascade RCDs in this case. 17th Edition installations will instead make use of multiple (minimum two) 30mA RCDs. The best solution being use of individual RCBOs for each circuit. Multiple CUs can each be fed from their own set of tails. 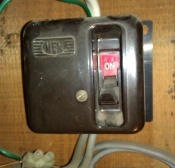 A Service Connector Block (aka "Henley Block") is a large junction box that can be used to split the tails from the meter or main switch enclosure, to allow the feeding of multiple CUs. Note these are available in single pole and double pole. The double pole devices will accommodate splits of both the Line and Neutral tails of a typical domestic supply in a single unit. When more that one CU is fitted, it is often worthwhile fitting an additional single "main switch" so that the capability to kill all power to all circuits with one action is retained. You may still be presented with the choice of metal clad or an "insulated" CUs (in the past, all plastic, but now likely to still be metal). On TN earthing systems either can be used. In the past, with a TT install you would use an insulated plastic CU since this minimised the possibility of a phase to earth fault occurring inside the CU before the RCD which may never be cleared (due to the high earth fault loop impedance of the local earth spike). For amendment 3 compatible installs using a metal clad CU, one can usually purchase a double insulation kit to better protect the incoming supply to the CU and reduce the possibility of any fault prior to the RCD(s) occurring in the first place. One should also check that the breaking capacity of the selected protective devices is adequate. Typically modern MCBs can break fault currents up to 6kA. This is usually more than adequate. However if you live in a large densely populated city, or very close to a substation then you should use the appropriate test equipment (most earth fault loop testers will have a capability to measure the prospective short circuit current) to measure the maximum prospective short circuit current to ensure it is below the maximum limit that can be safely broken by the selected MCBs. In situations where 6kA is inadequate, the use of HRC cartridge fuses may be more appropriate, or using some of the ranges of consumer unit and circuit breakers with higher breaking capacity designed for industrial or commercial use. Finally, many CUs will have their main isolator switch on the right hand side, however this is not universal and different brands of CU may favour placing the main switch on the left. Some can be reconfigured to your preference. The position of your electricity meter and the length of the tails may dictate that tails entry on a particular side is required. One job that frequently needs doing with a CU replacement is installation or upgrading of the main equipotential bonds between the main earthing point and the metallic services entering the building (water, gas, oil). Plan your work schedule carefully. Make sure you have enough time allotted to complete (or at least advance it to a appropriate intermediate stage) in the time / light available. Make sure any cordless tools you need are charged, and that batteries in test equipment are ok. You will also need to ensure you have enough natural light or suitable additional lighting to carry out the work safely. Head mounted LED torches are ideal for this sort of work. Again make sure you have spare batteries. Ensure you have adequate spare cable / wire to hand plus crimps and junction boxes etc should you need to extend circuit wires. Prior to replacement of the CU it is necessary to isolate the power feed to it. Some installations have an isolation switch for this purpose, however many don't and the other most readily available method is to remove the main service fuse. The official way to do this is to seek a temporary disconnection of the supply. More details on the procedure can be found here. Removal of the electricity distributor's main fuse yourself is not legal, however it is common practice. Unofficially it is reported that many of the supply companies would prefer electricians do this, rather than take the risk of working live. Great care must be taken when removing the fuse. It must only ever be pulled when there is no load on any of the circuits (i.e. all existing CU(s) turned off). These fuseholders may be of historic design (possibly dating from the 1940's or earlier), and may lack even fairly basic safety guarding. Touchable metalwork inside the fuse enclosure can be assumed to be live. Please see the additional notes in this article. It is possible to remove the tails and tape the ends over, but this is not recommended, as it does constitute a risk of injury, loss of sight and to life. Live working should not be attempted unless one has the correct equipment and knowledge to allow this to be done safely. Start by identifying and labelling all the existing cables that enter the current CU before disconnecting the wires. One mistake here can cause a fair bit of trouble later! 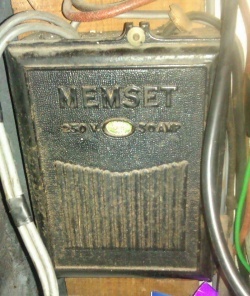 Depending on the design of the old CU it may be necessary to remove the fuses or circuit breakers first to be able to disconnect the circuit wires. You will probably need to straighten the wires to allow them to be pulled through the cable entry holes in the old CU. Take care if there is any old rubber cable present, since these will have fragile insulation easily damaged. As a general rule rubber wired circuits are not fit for re-use typically due to insulation breakdown, and undersized protective conductors. In some limited cases it may be possible to re-connect a rubber insulated cable, in which case great care will need to be taken to not damage the insulation while disconnecting and removing the wires. Sleeving rubber coated conductors before reconnecting is advisable. Once the old CU is out of the way, this is an ideal time to make checks on the existing circuit wiring. Round trip low ohms tests on ring circuits can now be carried out easily since both ends of the ring are readily available. Insulation resistance tests on individual circuits are also easy to carry out. If you find faults at this stage (like a ring circuit that has a broken loop) you may need to mark this for later attention rather than divert activity away from the main task now. You can always leave one circuit disconnected when reconnecting at the CU later. Some simple tests at this stage can also help identify likely causes of nuisance RCD trip later (like borrowed neutrals or earth / neutral shorts). First check and setup the CU as you require it. This may mean you need to choose where splits will occur on split load units. Often this will require the cutting of the live busbar to the required number of ways for each section. Even if the CU is apparently already setup correctly you need to make sure that all connections are tightly made and in the right place. The New CU does not have to be in the same location as the previous one. Obviously if it is some distance away then the existing circuit wires will need to be extended. Even with a CU in the same location as before it is not uncommon for wire extensions to be required inside the box simply due to different layouts. Inside the CU individual wire extensions may be crimped on (or made with Wago or other suitable joint connectors). Outside the CU then either junction boxes will be required, or fully insulated cable crimped joints be made. You may find it easier to fit any service connector blocks and smaller switch enclosures before the main CU is in place. Fix the CU in place - if this is going to require masonry fixings take care that you are not going to drill into any buried wires! Next the main earth connection plus the supply tails from the meter / switch / service block can be installed. These will need to be done using suitable size tails (typically 16mm² for supplies up to 80A, and 25mm² for 100A supplies). Once the main supply connections are in place you can carry out a visual inspection and a a couple of quick sanity checks with a multimeter to ensure you have got the polarity correct and there are no shorts on the supply. Note that with metal CUs it is often good practice to use a gland kit where the wires enter the CU to ensure the insulation can't be damaged by the sharp edges of the enclosure. Depending on the design of the CU it may be easier to install all the protective devices at the start, or it may be easier to do them one at a time as you reconnect each circuit. The latter approach is least open to error. Connect each circuit in turn following your labelling. If you have new circuits to introduce that were not connected to the old CU it can be worth leaving those until you have restored the original functionality and tested it. The MCBs or fuses should be labelled to show what circuits they supply. Installations using both wiring colour codes are required to have a notice fixed by the CU stating that both colour codes are in use. It is a good idea to label as you go to save confusion later. Once all the circuits are connected, another visual inspection can be done, and you can go over all the screw connections again to ensure they are tight. Check busbar connections to the main switch / RCD as well. A final sanity check with a multimeter will also catch any silly mistakes. With all the CUs turned off the power to the CU can now be restored (fuse replaced etc). All the individual ways should be turned off on the CU before turning on its main switch. At this stage you can carry out full RCD tests using an appropriate tester. Each of the individual circuits can then be turned back on one at a time, and functional checks be carried out. If all goes well you should now have a working electrical system again. However in a minority of cases you could meet problems. These may be ones that you have introduced during the CU change, or often, they are ones that were always there but did not make their presence felt until now. 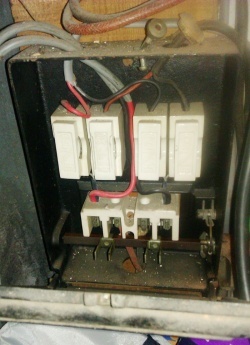 It is not uncommon for a new CU to trip the RCD as soon as power is turned on. There are a number of common causes of this, which are addressed in the RCD article. This page has been accessed 216,411 times.